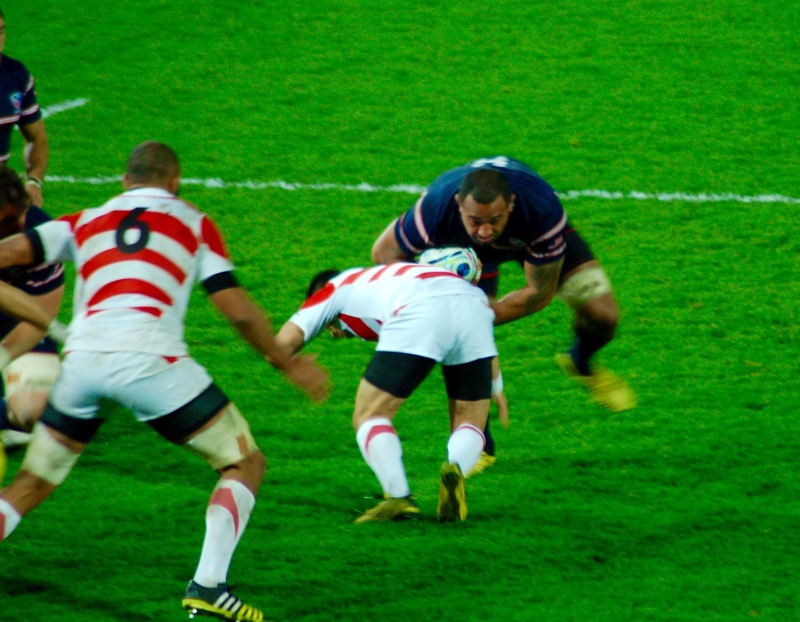 Japan’s forwards were able to push the U.S. pack around. Before we start the roll call of all that the United States did wrong in losing to Japan, let’s acknowledge that Japan did many things right. In beating the U.S. Eagles 28-18 Sunday night in the Rugby World Cup, the Brave Blossoms had the ball out quickly in all phases of the game. Their defense covered the field and mostly contained the U.S. backs. Their set play was superior to the Eagles’ and they took advantage when the U.S. did something wrong. Alan MacGinty’s kicks accounted for eight of the Eagles’ 18 points. And the wrongs they did too often put a stop to something they were doing right. The U.S. played ferociously at times, kept possession for loose ruck after loose ruck only to turn it over because of knock-ons or penalties. There was hard tackling by the Eagles, but also some missed ones that set up tries for Japan. Three minutes after the U.S. opened the scoring with a penalty kick by Alan MacGinty, the Japanese center, Craig Wing, ran through the U.S. defense. He kicked ahead and the Japanese had quick ball out of the resulting loose to overlap the U.S. backs and give Kotaro Matsushima a clear run in for the try. The conversion put the U.S. down 7-3 not seven minutes into the game. At 18 minutes, the Eagles set up a rolling maul, had it out and a cross kick to the wing looked like it could succeed, but the play was called back to a penalty by the U.S.
At 19 minutes, the U.S. kicked to touch at the five-yard mark on a penalty but the lineout throw was not straight and Japan chose a scrum and kicked to get out of trouble. Any momentum there might have been from the try was quickly extinguished as the U.S. forwards couldn’t handle the return kick, a Japanese player kicked through and the Japanese set up a rolling maul that eventually puts Yoshikazu Fujita (a winger in a rolling maul!) in for another try. The conversion by Ayumu Goromaru was good, and the States team is down 14-8. At 33 minutes, the Eagles are caught offsides and the penalty kick by Goromaru has the United States down 17-8. At 37 minutes, the Eagles stole a loose ball from Japan and a high kick was well covered with Zach Test tackling a Japan back in goal. 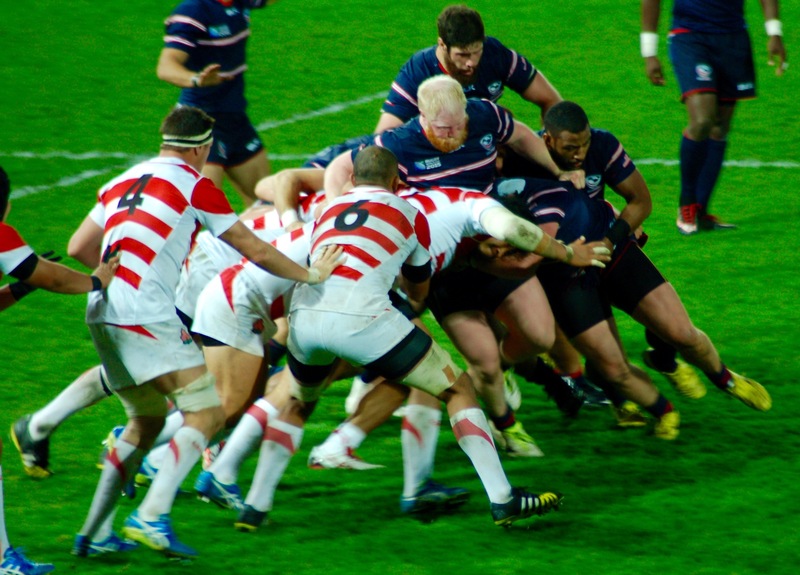 The U.S. won the scrum at the five, but the Eagles couldn’t get the ball out of a maul and the ref awarded a scrum to Japan. The U.S. forwards were called for illegal scrummaging and Japan kicked to touch to end the half, leading 17-8. At 44 minutes, U.S. penalty gave Japan three more points. They lead 20-8. Ten minutes later Japan was called for not releasing and MacGinty added another three. Japan leads 20-11. 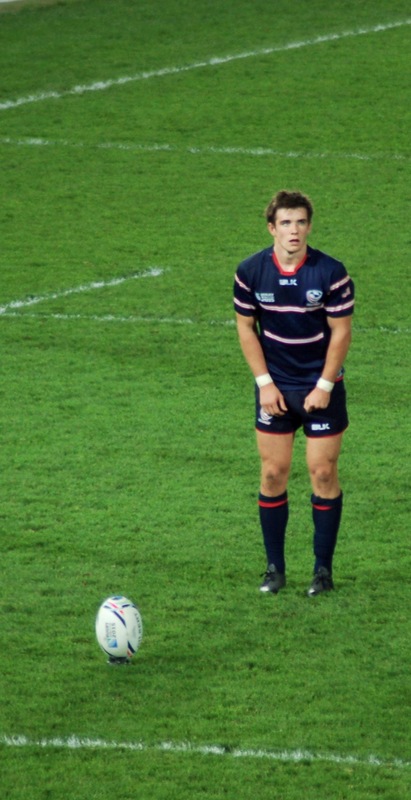 At 61 minutes, U.S. prop Eric Fry was sent to the sin bin for 10 minutes for deliberately kicking the ball out of the loose. Japan kicked to touch, won the lineout and Amanaki Mafi dived over for the try. They lead 25-11. The United States scored one more try on a long pass by MacGinty directly out to fullback Chris Wyles, who was alone on the wing and went in for the score. MacGinty converted and the U.S. were within seven points, 25-18, just a converted try away from a tie. And if nothing else, coming within seven points in a loss would have given the U.S. one point in the standings, erasing the awful zero that is there now. But at 77 minutes, the Eagles commit one more mistake, not letting the ball out in the loose, and Japan scored three more on the penalty kick, winning 28-18, leaving the U.S. with no wins in the tournament and no points in the standings. Japan had good coverage on defense for most of the night, but two lapses allowed the U.S. to score out wide, once by Takudzwa Ngwenya and another by Chris Wyles. Posted on October 12, 2015 by jbsaulPosted in RugbyTagged Japan, rugby, Rugby World Cup, RWC, USA Eagles.